Since 1991, the CFNU has been advocating for a public health approach to gun control, because ensuring public safety by reducing the risk of injury or death by firearms is an intervention measure aimed at protecting public health. Nurses are firsthand witnesses to the emotional and physical trauma that results from gun violence. Whether it is someone suffering after a suicide attempt, intimate partner violence, a child wounded accidentally, or a gang-related shooting, a nurse will be waiting in the emergency room to witness the outcome. 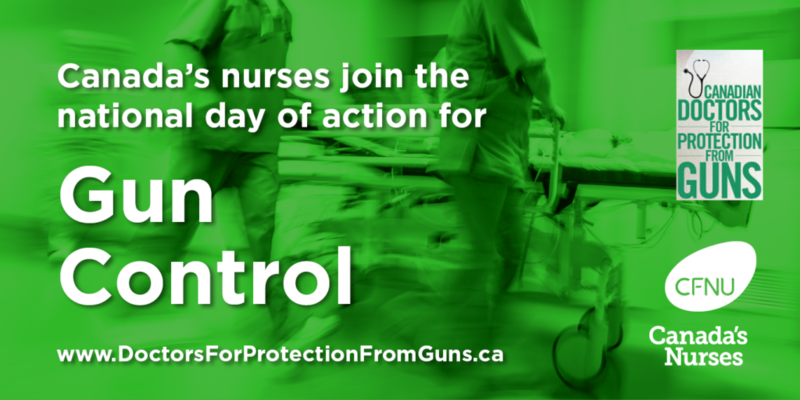 Over the last year, nurses have joined many in urging the federal government to pass Bill C-71, An Act to amend certain Acts and Regulations in relation to firearms. Click here to read our submission on Bill C-71 to the House of Commons Standing Committee on Public Safety and National Security.